Happy almost Halloween! This ensemble has been cobbled together from several sources, so we’re going to dive straight in. This highly versatile skirt is part of Scandalize’s Halloween gift available on their group gift wall. It’s sized for Freya, Isis, Maitreya, and Hourglass mesh bodies. 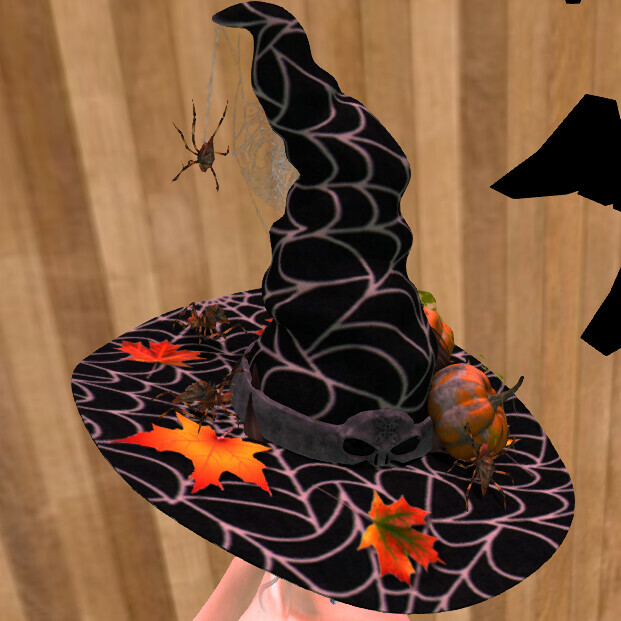 Next stop is the Cosmopolitan Room for this fun witch hat and sumptuous top. Simply join the event group and pickup these gifts on either side of the entrance. If you have not visited The Seasons Story (TSS) yet now is the time. Last day for this event is October 31st. This is The Seasons Story’s anniversary round, and 99% of the exhibitors have put out a free gift for event visitors. Our model’s eyeshadow is part of Zibska’s gift for mesh and classic avatars at TSS. Catwa and Lelutka head wearers can indulge their love of cosmetics with a new set of fall lipsticks from Amara Beauty. While at TSS you can find this charming manicure at the Mignon booth. This is an applier for Maitreya nails only. 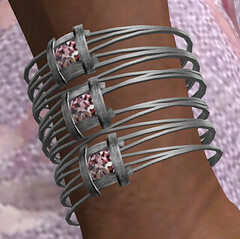 The lovely bento rings are another gift for Maitreya wearers that can be found at the Mug booth. Pop over to Sn@tch to pickup these fantastic boots. The Lorna boots are this year’s Halloween gift. They are free for all visitors at the front desk. These boots come with a fantastic HUD containing 8 Halloween/Gothic textures and 28 shades to apply to the laces and insert. They are sized for Maitreya, Slink, Belleza, and Tonic bodies. Since they are boots classic avatars can wear them too by simply borrowing an alpha from other boots in your inventory. Near the boot gift is another freebie: the Shopping Bag with lots of goodies including the modeled Spellcraft earrings. To the right of the desk is an area that has several completely free items. One of the gift bags contains the eyes our model is wearing. The Shining Eyes gift contains 27 system eyes and a set of mesh eyes with a 27 color HUD. Thanks Sn@tch for the outstanding gifts!